SPRINGFIELD, Ill. -- Officials with the U.S. Department of Agriculture in Illinois plan to seek a federal disaster declaration to make farmers with flood-damaged crops eligible for assistance, as flood warnings persist along several state waterways, including the Illinois River. The declaration would make farmers who faced extensive spring and summer flooding eligible for loans and possibly emergency funding, according to Scherrie Giamanco, state executive director for the Farm Service Agency under the USDA. 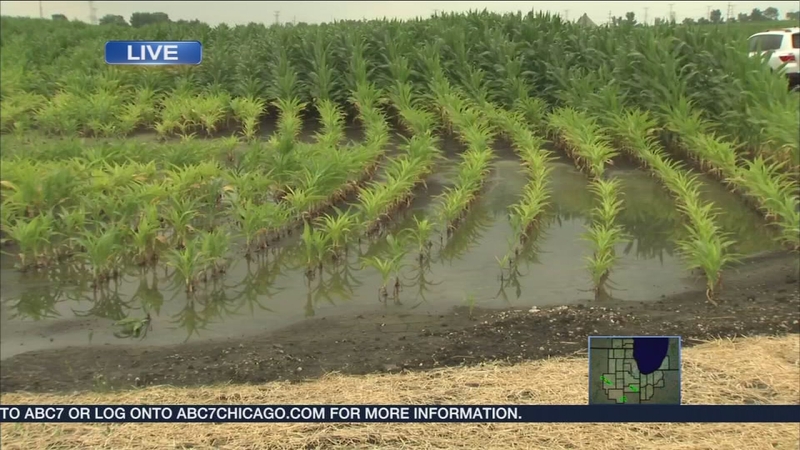 County FSA offices across Illinois have collected damage reports on corn, soybeans and other crops, she said. The declaration request also is backed up the Illinois Department of Agriculture and Gov. Bruce Rauner, Giamanco said. Illinois registered its wettest June on record this year and July has also been unusually soggy, state records show. The average statewide precipitation last month was nearly 9.4 inches, breaking the previous record of nearly 8.3 inches for June, which was set in 1902. The USDA's field report for this week found that more than half of Illinois' soybean crop and 44 percent of its corn crop were in poor to fair condition. Only about three out of seven days during the week were suitable for fieldwork. Flooding has drowned about 40 percent of crops in Iroquois County, where fields seem to have been hit the hardest, said state agriculture director Philip Nelson. Further north in Jackson County, a handful of farmers have reported varying field conditions, said Jessica Grammer, the county's Farm Bureau manager. Depending on where you are, "it could be a pretty good crop," Grammer said. "From what I hear, most of the corn that did not get too much water or flooding issues is looking pretty decent." "Usually, we're begging for rain in July and August, and this year, we're like 'please quit'," Robertson said. Farmers experienced a record year for corn and soybean production in 2014.